Talal Kassem, a 17 years old boy, paid with his life the price of crossing the street. He was hit by a car on his way to school on October 19th, 2010 in Beirut. After this tragic event, Talal’s family undertook many initiatives to improve citizens’ safety on the Lebanese roads with the support of their friends and some official figures. For those of you who don’t know, the Lebanese roads are often compared to “jungles”: A dangerous place where no rules apply. 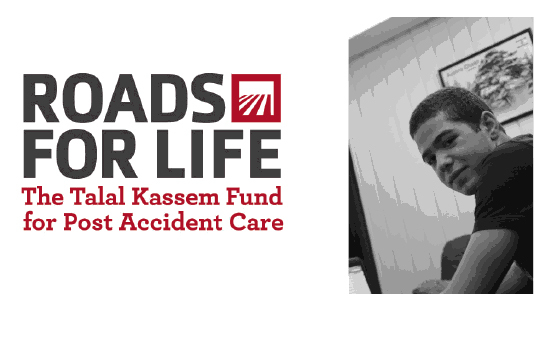 Lately, Talal’s family created Roads for Life – The Talal Kassem Fund for Post Accident Care an organization whose goal is to enhance chances of survival at hospital’s emergency rooms in Lebanon. “The Advanced Trauma Life Support course teaches a systematic, concise approach to the early care of the trauma patient. This course is vital to guiding care for the injured patient in emergency department trauma rooms. ATLS course training provides a common language that can save lives in critical situations.” (Source American College of Surgeons). In early 2011, the ATLS course was introduced in Lebanon but, since it is expensive it is offered to a relatively small number of surgeons and emergency physicians. Roads for Life main objective is to make this course available to the greatest possible number of physicians and surgeons in Lebanon by offering them the entire sessions of the ATLS course free of charge at the AUBMC (American University of Beirut Medical Center) which has all the necessary equipment and materials for training the physicians. Sessions should begin before October 19th 2011 and will have 16 participants per session. I should note also that all registered doctors will receive a certificate from the American College of Surgeons upon the completion of the course. 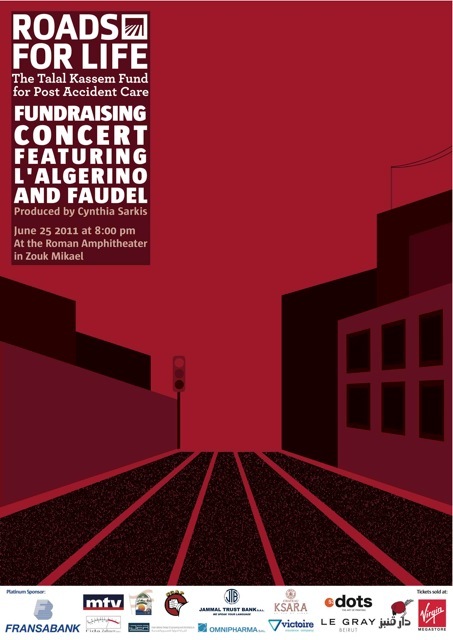 On June 25th 2011, Roads for Life is organizing their first fundraising event: A concert featuring L’Algerino and Faudel, two great French artists, at the Roman Amphitheater of Zouk Mickael. This is an important cause we should all support, spread the word. The Concert Event Page – Roads for Life Facebook Page – Roads for Life Twitter Account.